52 Ancestors, No. 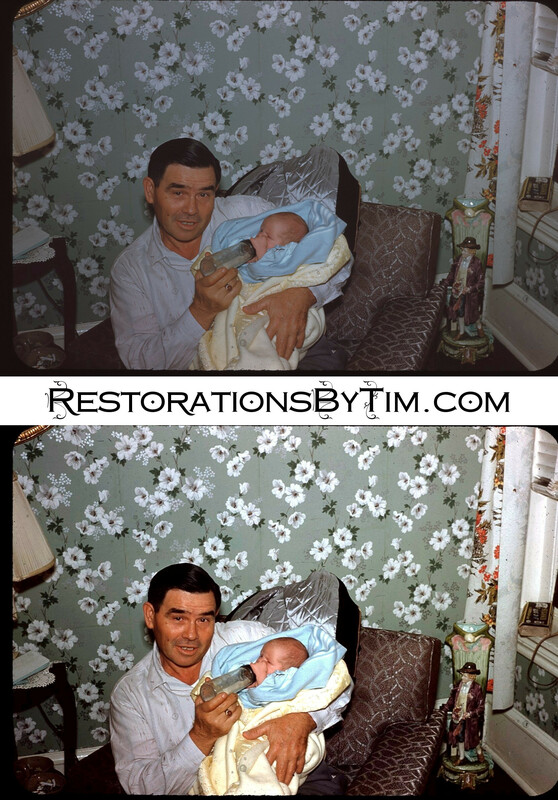 9: William Pickersgill “Pud” Harrison, III, an Amiable Longshoreman | Photo Restorations by Tim G.
I’m continuing with great-grandparents this week. Here’s one about whom I’ve never heard an ill word spoken. 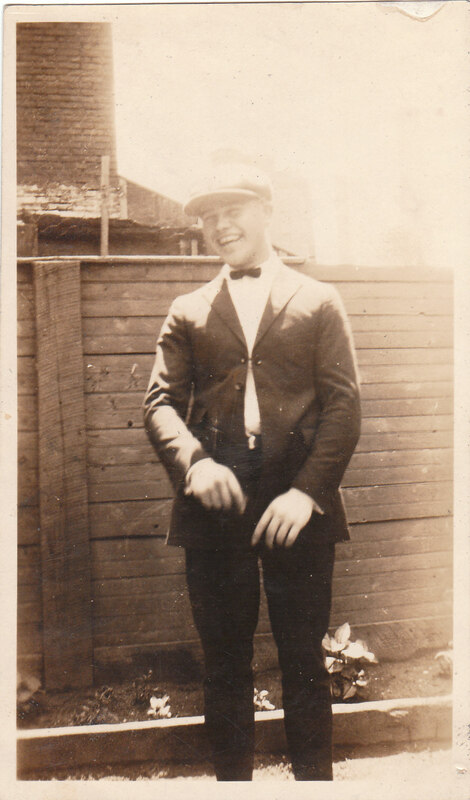 This is William Pickersgill Harrison, III, aka “Pud”, my father’s maternal grandfather. He was born on February 15, 1905 to William Pickersgill Harrison, Jr., an Philadelphian inspector for the Pennsylvania Rail Road, and Cora Kline, a former Lancaster County farm girl. He was baptized at St. James Protestant Episcopal Church in West Philadelphia.Cora’s family back in Lancaster raised Pud’s older half-sister, Anna, and death came quickly to another of Pud’s older sisters, Harriett, who left the family before the age of two. The family that Pud grew up with consisted of his parents, two older sisters, Blanche and Cora, Jr., and a younger brother, Charles, aka “Blutty”. A young Pud Harrison, smiling. Pud was the last to carry the original family name of Pickersgill. His grandfather was born William Harrison Pickersgill, according to Civil War pension documents, in mid-1840s. Pud’s grandfather switched his middle and last names shortly after his service in the Civil War because, the documents say, he was “not liking the name of Pickersgill”. The documents offer no further insight into what about the name he found to be unsavory, but apparently he tolerated the name well enough not only to keep it as his own middle name, but also to pass it on to both of his sons, Edgar and William, Jr., as their middle names. William, Jr., in turn, passed the middle name on to Pud, his first born son. Pud, too, was “not liking the name of Pickersgill”, and preferred to keep the name to its initial, when that was necessary. His sisters apparently teased him about the name throughout his life. Even in adulthood, Pud’s sister, Cora, enlisted Pud’s children to needle him about the middle initial and the name it stood for. Pud broke the Pickersgill chain in March of 1942, when he named his own son William Joseph. William Joseph Harrison, my great uncle, asked me to research the origins of the Pickersgill name, and I was glad to confirm the story of its origin for him before he died in 2012. William Pickersgill Harrison, III, was apparently less troubled by his boyish nickname than he was of his regal-sounding middle name. I understand that he was widely known as “Pud”. Many of the people I’ve spoken to, like his son-in-law, my grandfather, and my grandmother’s cousins, all refer to him primarily as “Pud”, rather than William. Although I’m having trouble recalling whether or where I’ve confirmed this, I believe, exactly as it says on the tin, that Pud liked to eat pudding. I should confirm that, however, before I pass it on as the official explanation. In his younger days, Pud lived with his family on Shackamaxon St., near the Delaware River, where he worked as a longshoreman with his brother, Charles, aka “Blutty”. Their house was literally between the docks off Delaware avenue, where they worked, and the office where they paid their union dues. I learned in correspondence with Charles’ son, William, that, whereas the job was physically demanding, the brothers developed thick, muscular builds. “Pud was a tough man,” William wrote to me, “but he would go out of his way to avoid violence. My father thought that fist fighting was a sport like football.” Pud’s amiable demeanor is evident in many family photos. Charles, on the other hand, apparently got his nickname, Blutty, from the bloody injuries he regularly sported after many a tussle on the docks. These tussles often culminated with a pugilist hurtling toward the water. 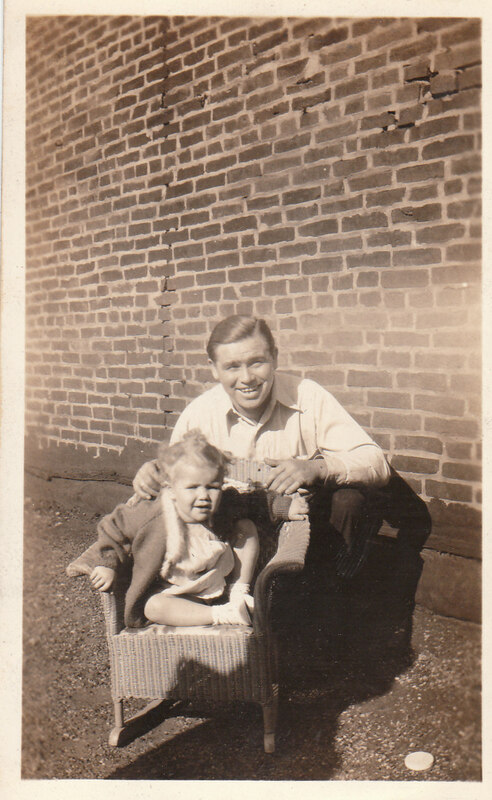 A slightly older Pud Harrison, still smiling, with his baby girl, Joan. Tragedy struck the Harrison family in late 1926 when Pud’s father died, as I understand, from complications to injuries sustained in a fall from the crane on which he worked at the time, loading cargo onto trains for the Pennsylvania Rail Road. This, I hear, was the result of the negligence of someone in a position to operate the crane while William P., Jr., was out of the cab and in an unsafe place, perhaps performing either an inspection or a repair. I understand that the P. R. R. offered William’s wife, Cora, a lifetime of free rail travel in partial compensation for the wrongful death. Another effect of the tragedy, I understand, is that the Harrisons thereafter lost their faith in religion, and stopped attending church. Pud’s daughter-in-law corroborated the fact as to Pud; she heard him admit that he did not believe in the divine. I found this to be very interesting, and a relative rarity in my family. Having never felt drawn to spiritual concerns myself, I felt I could relate uniquely to Pud’s incredulity. Pud married “Great-Grandmom” Johanna Christina Smith on February 5th 1930. They had two children: my grandmother, Joan, and my great uncle, William Joseph. Johanna was an Irish Catholic, who insisted on raising her children in the faith. Pud abided, with the result that my grandmother developed into a devout Catholic, and, as I saw her, my family’s spiritual anchor. Pud himself would eventually convert to Catholicism on his deathbed, though I have yet to fully investigate his motivation for doing so. Like many of my family’s heroes, Pud Harrison died before his time. He contracted carcinoma of the lung, and died on August 5, 1959, at the age of 54. He was buried in the cemetery at St. Dominic’s Catholic Church in Northeast Philadelphia, where his wife, Johanna, would join him in 1987. Although the image usually comes out great after a single click, some tweaking may be in order. Next to the Auto button are two other buttons for specifying black, gray, and white points. I find the the auto correct often makes an image too bright for my liking, and the Output Levels bar above the Auto button helps to tone that down. Pro-tip: If the photo in need of color correction has a white border, I recommend selecting the color portion to correct that alone, rather than correcting the entire image. The white border tends to throw off the color calculation. 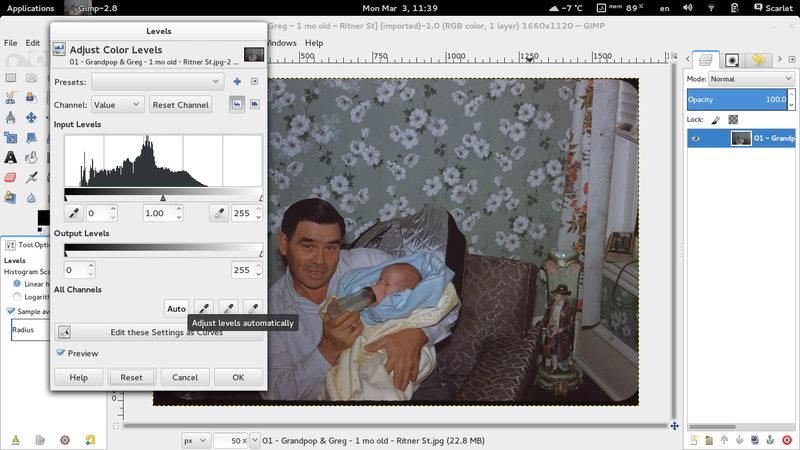 Lastly, some images simply do not correct well under this method. For those I recommend a good, old-fashioned Brightness/Contrast adjustment. Many thanks to my Pop-pop, and also to Pud’s niece, Doris, and Nephew, William, and daughter-in-law, Lorraine, for contributing their memories of Pud Harrison to my family history project.